Teaching kids to shoot firearms, if nothing else was of any benefit, would make recreational shooting worth it. 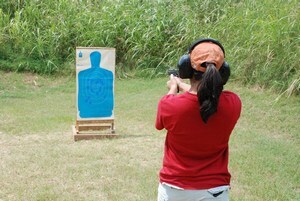 Since starting the Right On Target group, we have taught lots of adults how to shoot handguns, rifles, and shotguns. Teaching adults is great, but nothing equals watching a grade school kid or teenager take to it and their face light up when they hit the target. Or when they experience the victory of watching their first clay pigeon disintegrate after leading and shooting it with a shogun. Teaching kids to shoot is an experience all it’s own. Our daughter, Jacquilyn, came to live with us late in her childhood when she was nine years old. Now at 19, she has gone through a lot of “stages” that all parents of teenagers will understand. I taught Jacquilyn to shoot a pistol when she was 12. Since then she has gone from liking it, with her own 9mm pistol, to disinterest, to liking to shoot only 22s. Then all of a sudden she wants to shoot everything. 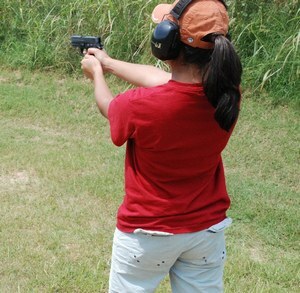 She is now one of the most cautious and competent gun handlers at the range. Let your kid's interest in the shooting sports develop naturally. So, the first lesson in teaching kids to shoot is to accommodate them. Don’t try to play out through them what you want them to be or do. That’s a good life lesson on raising kids for any situation. When it comes to shooting, you want them to really enjoy what they are doing, whatever they’re shooting. For those of us who are avid adult shooters, we know a range session can be anywhere from a few hours to infinity. When teaching kids to shoot, don’t overdo it. 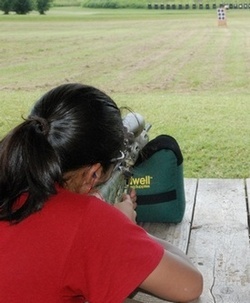 When you take them out to the range, consider their attention span, interest level and especially comfort. 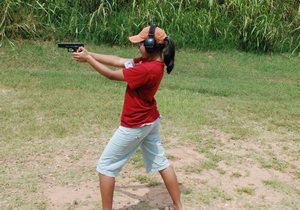 If it’s too hot or cold, that factor alone can make your time with your kid at the range a one time only affair. 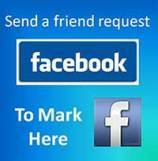 NOTE: They will associate the activity with the worst common denominator of the trip, not the best. And the next time you ask them if they want to go shooting, they will make their decision on that basis. When you take them, go for them, not you. Go with their needs in mind, not yours. If it’s cold outside, have a portable heater for their hands. If it’s hot, go someplace with shade and bring plenty of cold water and snacks. This is counter intuitive, but stop shooting before they are ready to go. Why? Because you don’t want to stop when they are completely worn out. You want them to anticipate a future trip. Strategy rules when teaching kids to shoot. Variety is the spice of life, and teaching kids to shoot should be filled with variety. That precision custom 1911, .45 ACP may be your baby that you like to go out and shoot for hours on end. You may like to put it in a ransom rest, set up a chronometer to measure velocity, do all the controlled breathing, trigger control, slow sight shooting……..
That’s all ad nauseum to kids. Kids want to shoot what they are comfortable with, and what is fun to shoot. It doesn't mean not to teach them. It means keeping the teaching variety and fun filled to keep their interest. It’s the same principle as when I take kids fishing. I don’t take them fishing for Stripers. I take them fishing for bluegill. Because most kids would rather catch a hundred smaller fish than to search for hours for a couple of big ones. They want to watch stuff splatter, and at the very least, they want to shoot something unique. Most kids don’t have a pet gun. They just like to go “boom” with something that doesn’t scare them. So, when teaching kids to shoot, break out the .22s, get some Shoot-N-C targets, cheap canned sodas, potatoes, bowling pins, anything entertaining to shoot, and set them up. Shoot your hand cannons and rifles next to them and let their curiosity decide when they want to shoot something bigger than their plinker. Even then, don’t insist on them going too fast, or that they keep going with any gun that makes them uncomfortable. Let it progress naturally at their pace. Now teaching kids to shoot does not mean teaching them bad habits. Correct, safe gun handling is essential, and we all know failure to do this can be fatal, so it’s non-negotiable. Finger off the trigger, pointing downrange, correct carry of the gun, are all necessary. Just remember, they are kids. That’s why they need you close at hand until they get it right. Don’t crucify them for mistakes, just be as close as their elbow to make sure no accidents happen until they get it right. Don’t yell, push, hit or demean your kid or you’ll never get them back to the range. And when they get it right, the reward should be fun, comfortable, variety filled shooting. The net result of shooting for several years with my daughter with her just shooting a .22 rifle, and .22 pistol, were all of a sudden her wanting to shoot everything I own. A range session just before this article was one of the best experiences I’ve had with her. It shows the results of letting her decide what she wanted to shoot. She just decided one day that she wanted to go to the range and “shoot some different stuff”. Being a rather ahem……stubborn teenager, it almost killed her to admit she wanted to do this, but I didn’t make a big deal about it. I just said “ok” and loaded up what I figured would work for her. First she shot the .9mm GLOCK, at a silhouette target. This was the first time I let her shoot a silhouette, but I figured it’s time to deal with the self defense aspect of shooting. I set her up about 8 feet away from the target (another important factor in teaching kids to shoot). Don’t set your kids up 25 yards from a paper target and insist they exercise proper trigger control until they can cluster all shots in the middle of the target. You can’t do that so don’t insist they do it. Set them up close to the target so they can experience immediate success. She then tried my Sig Sauer .45. Put most of the rounds in the 9 and 10 ring and seemed rather satisfied with herself. She was actually smiling when she started shooting my Sig Sauer.45. It seemed to be pretty natural for her and she did quite well with it. I then let her pick her distance and she tried shooting both the silhouette and some regular paper targets with pretty good results. Even if she only hit a couple of times in a target from distance, I pointed out to her that if it was a bad guy, she would have succeeded in defending herself. When teaching kids to shoot, success rules, no matter how vague it has to be. Anyway she shot .9mm, 40 S&W, and .45ACP with no problems and seemed to enjoy every second of it. Teaching kids to shoot and making sure they are satisfied is a study in strategy. But it was hot outside, and I saw her begin to suffer from it, so I asked if she wanted to go shoot some rifles (which would be in the shade). The answer was a quick affirmative and off we went to the 300 yard range. Now does that mean we shot at targets 300 yards away? Of course not. I went out to about 70 yards and set up one of my personal wood target stands with some Dirty Bird targets (splatter type visuals). 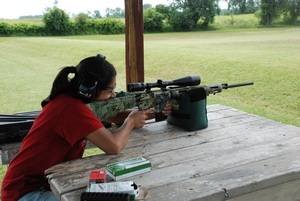 The first rifle she shot was my ultra cool Remington R-15. She had some problems with the scope and getting a good cheek weld. She had some problems bumping the ear muffs on the stock, some protests, etc…..the kind that try the patience of an adult. But I calmly dealt with each issue and finally, she ended up successfully putting about 15 rounds downrange actually hitting some of the targets which I quickly affirmed as “great shooting”. 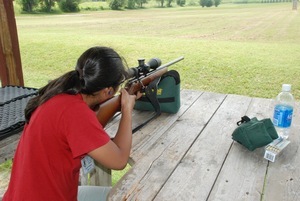 The last session was with the fun Marlin 17 HMR which she enjoyed shooting. Then it was over….actually before she was quite ready…. Remember to go before they are quite ready. That doesn’t mean get them started and then jerk the rug out from under them. Just stop before they are quite ready. After we loaded up and left, we headed straight for a couple of Hawaiian Rainbow snow cones to round out a perfect range session. I love that kid in the pictures to the point that I would quickly give up my life for her. I want her life experiences to be positive and productive in moving her forward in all areas. 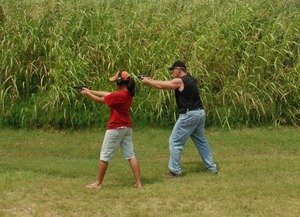 It’s challenging for me or any parent to keep a balance when teaching kids to shoot or anything else we try to teach them. But if we remember to keep everything we do with them about them, and not about us, we’ll succeed.